James Scott Jones, 28, passed away on December 2, 2018. Born May 20, 1990 in Murfreesboro, TN he was the son of Janet Raymer and Alan B. Jones. A dedicated and hard working individual, he was employed at Globe Manufacturing through Local 502 Pipefitters Union. He was a member of Masonic Lodge 942, and an active member of Beechland Baptist Church in Louisville, KY. 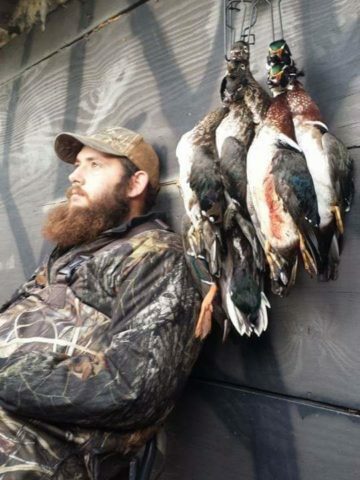 In his spare time he loved duck hunting, being on a tractor, 4 wheelers and mudding. He was also an avid reader. He will be remembered as a very giving person who never met a stranger. He is survived by his mother, Janet (Pam “Step Daddy”) Raymer; his father, Alan (Beth) Jones; his daughter, Kensington Grey Jones; his brothers, Jeremy A. Jones, Lukas Jones, James Jessie, Michael Jessie and Daniel Lloyd; his sisters, Amy Jones and Victoria Jessie; his grandparents, Jim and Gwen Garrett, Judy Adcock, Marilyn and Jerry Raymer, and Allen Simmons; 3 nieces, 1 nephew, extended family and numerous friends. Visitation will be held at Cole & Garrett Funeral Home, Goodlettsville, TN on Thursday, December 6, 2018 from 1 – 3 pm. A Celebration of Life Service will be held at the funeral home Thursday at 3 pm. Another memorial service will be held the evening of Thursday December 13th at Beechland Baptist Church. Such a wonderful man. He make everyone feel special. All the family in my prayers. So sad to hear of Scott’s passing, what a shock!!! Scott was one of the sweetest, kindest, such a gentle, polite and loving young man I’ve ever known!!! He was so sweet & attentive to my Daddy (Daddy Gene) especially when Daddy had some trouble walking alone and getting up & down!!! Scott was always there to lend a helping hand to Daddy Gene!! Scott was also so loving and kind to my sister Sandra too (Kasi’s Nana), and, oh how Sandra loved and thought the world of Scott, and when Scott & Kasi were together, he was so respectful, loving & kind to her…and for those very reasons, I loved Scott Jones also!!! “Go rest high on that mountain Scott, your work here on earth is done”!!! A precious life taken way to soon, but I’m sure GOD had a plan for Scott!! Our love, thoughts and prayers to Scott’s family & friends!!! as to what your family is going through right now! Scott was an amazing young man, n will truely be missed by so many.. please know ya’ll are in my thoughts! I am so sorry for your loss. No parent should have to bury a child. May he rest in peace and prayers for you and your family during this time. So sorry for your lose. Prayers. My thoughts and prayers to all his family and friends. I had the blessing of meeting him a few times and he was always very respectful and kind. Justin, I’m here for you son, I’m only a call away and a 10 min drive. Fly high Scott Jones. You will be missed terribly! I’m heartbroken. God Speed. Prayers Alan and Beth for your whole family. Scott was one of a kind and always had a smile on his face. My dear friend you will missed greatly. K know you will be looking down on us and with us at the night to shine. Goggle Evergreen Symbolism : Think of James Scott Jones ( WHO ) JAMES SCOTT JONES when you see an EVERGREEN Tree !! You want be sorry. I met him when he was 12 years old +-, he became part of my extended family. I personally witnessed him seek membership in an organization and would have been accepted if he had allowed to misrepresent the truthfulness of his desire to be a part. He elected for the TRUTH above easy access. He did achieve membership at a later date the correct way.